Pre-heat oil to 370 degrees in a deep fryer or medium pot filled no more than halfway while preparing chimichangas. Peel, core and dice apples. Melt the butter in a saute pan over medium heat. Add the brown sugar, stir until the sugar is melted and smooth. Add apples. Saute until fork tender, but not mushy. Sprinkle cinnamon, nutmeg and salt over mixture and stir in lemon juice. Prepare tortillas by warming the slightly in the microwave. Tortillas will be more pliable when warm. Don't over cook or they will dry out. Cut edges on three sides of the tortilla to square off the edges and make it easier to wrap them around the apples. Spoon filling onto tortillas and roll them into a burrito shape. Secure with toothpicks. Test the heat of the oil with scraps of tortilla. The tortillas should bubble and float to the top when the oil is the proper temperature. Do not add the chimichangas until bubbles appear. Fry the apple chimichangas until golden brown and crispy, not hard. Drain on a paper towels. Pour cream into a chilled glass bowl. Whip halfway to soft peaks. Drizzle the caramel sauce into cream and continue whipping to medium peaks. Dust apple chimichangas with powdered sugar. Top with a dollop of caramel whipped cream. Dust cream with ground cinnamon. 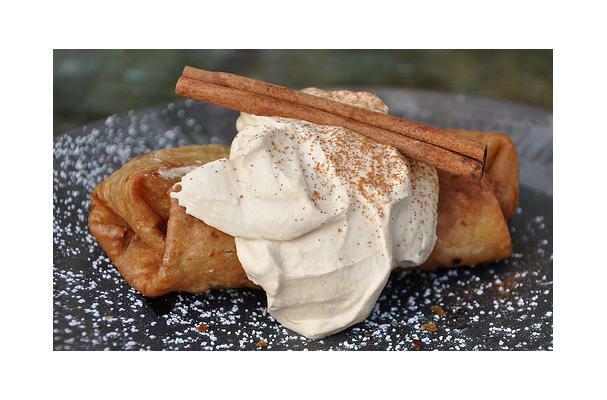 Dress up the chimichanga with a cinnamon stick if desired. I crave apple pie in the fall. But, I don't crave making pie crusts! The mess, the fuss, the scraping dried bits off the counter... did I say mess? That's one reason I make Mini-Apple Chimichangas. The other reason? They're fast, easy and... fried! Even apple pie tastes better fried.